Welcome to all of our Friends near and far. We wanted to take the opportunity to give those of you that haven't had the chance to see us at an art show, a better idea of what we do on our weekends at shows...how we set up...our displays...how we interact....and a chance to view some of our newest artworks that I have not been seen by anyone yet. 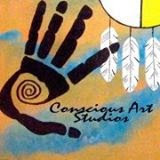 Have a little tour and see what our Conscious Art Studios art booth is like. We enjoy bringing the elements of our world and the beauty that surrounds us into our artwork. Color and Symbolism play a big part in this. 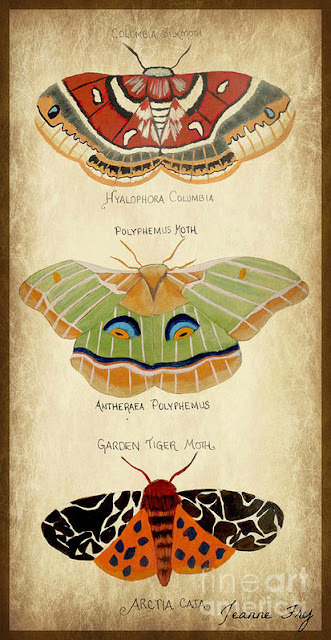 The majority of our art seems to revolve around animal totems, I suppose because we can learn so much from them. Within our art booth we bring a blanket of color, nature, and peaceful music to the senses. This week I was inspired by not only nature, but the upcoming holidays as well. Having found several different types of feathers on my walks through our woods, I decided to create a few small paintings paying an honor to some of my favorite bird totems and bringing a gratefulness to them for their wisdom. The upcoming Day of the Dead holiday, Dia de Muertos, inspires me every year to create some pieces. I love ritual and symbolism, and the honoring of those that came before us. This holiday speaks to all of those things for me. Now this next piece is not associated with the Day of the Dead, but does resonate with the time of year when we all become enchanted with tales of Edgar Allan Poe. This is a mixed media piece inspired by one of his stories titled "The System of Dr. Tarr and Professor Fether". If you haven't read the story, I urge you to do so. It's one of my favorites. The painting is my rendition of some of the characters i the story. Thanks everyone for stopping in. I have a bunch more new pieces to add, and will keep adding them over the next few days. You can always check into the our Artfire Shop and browse around. Hi, Jeanne - would have loved to have seen you and your art at Shakori! Is that where these images were taken, or are they a compilation? Some of the images are from Shakori and some from other shows here in WNC. I wish I had seen you there too...as that is where we had met. It should be a tradition now. Oops! Never mind - watching on the big screen with Doug I could see better that you've been in lots of different types of venues. What's your favorite one, or could you choose? Agreed! It SHOULD be a tradition! I would be hard pressed to choose a venue though...we have done shows in NC, SC, Georgia, Florida, and Tennessee. Love you too Darla ! Sorry I missed your live show! LOVE it ALL ! But especially your little FEATHER paintings ! Beautiful !